BANGKOK, THAILAND: Global search and rescue charity MOAS (Migrant Offshore Aid Station) will begin a new mission in South East Asia on March 3 in the Andaman Sea. The M.Y. Phoenix and its crew will coordinate with local coast guards, navies, local NGOs, experts and the media to track, monitor and, if needed, provide search and rescue in coordination with the responsible authorities. MOAS will maintain positions in the Andaman Sea and adjacent waters. It will use long-distance drones to measure movements of ships that may be transporting refugees or migrants. In meetings between MOAS principals and various local and national government authorities, it was agreed that preventing loss of life at sea was a high priority. “The task of the M.Y. Phoenix will be to observe and analyse irregular movements at sea with the goal of supporting local stakeholders in providing an enhanced life-saving response. Our aim is to generate a better understanding of the movements by the refugees and migrants and be ready to assist in cases where there is an imminent threat to loss of life,” said MOAS founder Christopher Catrambone. MOAS will be the first NGO to provide a comprehensive first-hand regional assessment of irregular migration and trafficking using a vessel with an unprecedented technological capability. Data gathered will be analysed and the results shared. The goal is to bring a better understanding and awareness of the problem and encourage everyone to work for sustainable solutions. Supporting MOAS onboard M.Y. Phoenix will be two other NGOs. Malta-based NGO MigrantReport.org, a news organization that focuses on migration issues, will be providing information through its ground networks. Fortify Rights, a human rights organization based in South East Asia with experience working closely with refugee communities in the region, will manage data collection and documentation as well as provide contextual guidance. It will use Schiebel S-100 Camcopters (drones) to measure movements of ships that may be transporting refugees or migrants. In meetings between MOAS principals and various local and national government authorities, it was agreed that preventing loss of life at sea was a high priority. 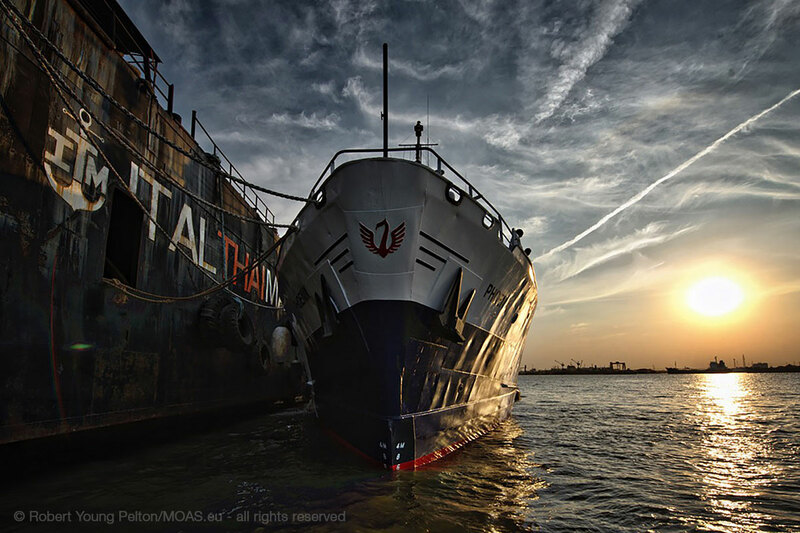 MOAS will sail out in early March and remain at sea for a minimum of four weeks. At the end of this period MOAS will review its findings and funding provisions with stakeholders. MOAS will be operating within the existing legal framework of the laws of the sea and has engaged in open dialogue with all regional stakeholders, including Malaysia and Thailand. The crew aboard the M.Y. Phoenix include maritime, security, medical, linguistics, migration, mapping and aviation experts. They will be supported by the MOAS staff in Malta and a variety of international experts and professionals to assist in the core objectives. “As we have already successfully done in the Mediterranean and the Aegean seas, we are cooperating and participating in an ongoing dialogue with regional stakeholders to see how our mission can be best performed. We are leaving no stone unturned in our mission to mitigate loss of life at sea,” said MOAS director Martin Xuereb. MOAS is a registered NGO based in Malta founded by American entrepreneur Christopher Catrambone and his Italian wife Regina. Since late 2014, MOAS has used the M.Y. Phoenix to locate and rescue almost 13,000 people from the Mediterranean Sea. After becoming the first private rescue operation in the Mediterranean, MOAS spurred other NGOs and the EU to respond directly to the mass casualties. MOAS currently operates in the Aegean Sea aboard the 50-meter Responder, saving people in what is the deadliest year on record for migrant drownings in the region. The Emergency Recovery and Response Vessel (ERRV) Responder, equipped with two fast rescue boats, has been instrumental in rescuing hundreds of refugees in hostile winter conditions since December 2015. The two fast response boats deployed by Responder are named after Alan and Galip Kurdi, two young Syrian brothers who drowned off Turkey in September 2015. Fortify Rights is a non-profit, non-governmental human rights organization based in Southeast Asia and registered in Switzerland and the United States. Founded by Matthew Smith and Amy Smith, Fortify Rights works to prevent and remedy human rights violations. The organization investigates abuses, engages stakeholders and people with power, and works closely with affected communities and human rights defenders to strengthen local responses to abuses. Migrant Report is a news source that covers migration topics in depth. Using local ground networks, the site interviews, documents and publishes the granular first-person data needed to understand the complexities of global movement. Mark Micallef, executive editor of the Migrant Report, will create coherent and in-depth coverage of the MOAS mission along with its mapping division. 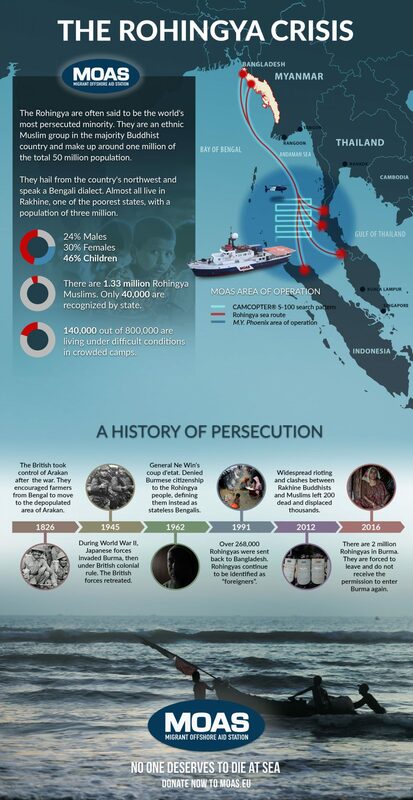 Last year over 25,000 of the 1.2 million Rohingya in the region fled by sea. They typically move southward from Myanmar and Bangladesh, with monsoonal conditions allowing for a 10-day voyage from Northern Myanmar to Thailand or Malaysia. Many spend over a month at sea. Some never make it. Mr Mohiuddin Mohamad-Yusof, the president of the New York-based World Rohingya Organisation, believes 200,000 Rohingyas may leave Rakhine state in 2016. The UNHCR estimates that 1,000 have left so far. While departures of Rohingya have decreased since last year, nobody knows how many Rohingya will take to the sea or how many will perish during these journeys. While initial estimates place the mortality rate of Rohingya refugees at sea at less than 2%, ground research by MOAS indicates the missing and dead may be closer to 10% as found in other mass seaborne exoduses, such as in the Vietnam era. The research that will be done on board the M.Y. Phoenix in March will coincide with surveys and interviews in refugee camps.